...that had its tail section shot off, and the tail gunner rode it to the ground like a glider? Years ago, I saw something in a magazine (I want to say that it was probably an old copy of Air Force Magazine) and I can’t recall if it was just a cartoon, or indeed a true story. I remember seeing an illustration (not a photo) of the broken tail stuck in a tree, and the gunner hopping out onto the ground. I tried to google it, and I stumbled upon this photo of a severely damaged Flying Fortress, which is said to have made a successful landing without losing its tail. Come to think of it, the image that I’m thinking of was probably from one of Bob Stevens’ “There I Was...” cartoons. When I tried to google that, I found the top image, which -despite its relevance- is not quite the one I’m looking for. I found this one too, also by Bob Stevens. I’m not sure if it’s another panel from the same comic strip, or its own thing. 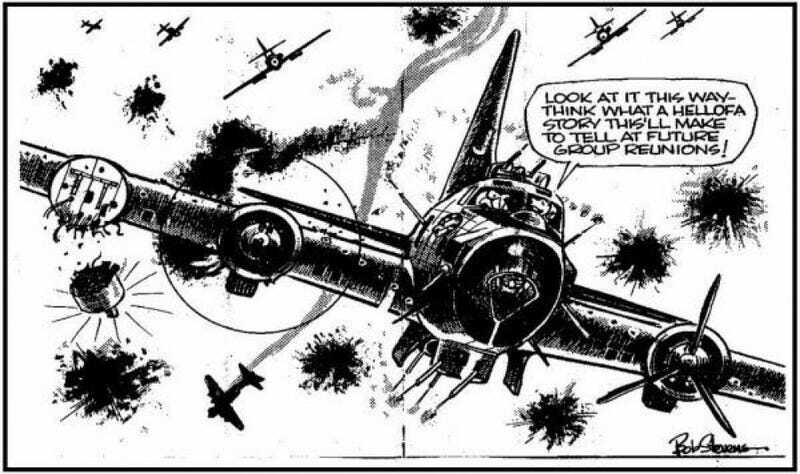 The humor suggests that it’s just a cartoon, but the image of a B-17 tail stuck in a tree is burned into my memory, along with a feeling like it was presented as a true story. That’s as far as my memory and google-fu have managed to get. Does this sound familiar to anyone?